Relationships between men and women are complicated enough when there is just two people involved. 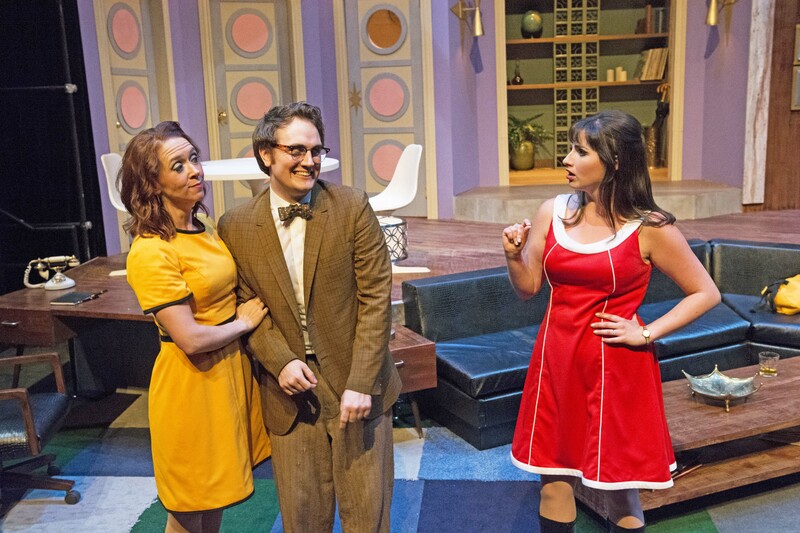 But, in Lyric Arts’ newest production of the 1960’s comedy Boeing Boeing, Bernard (Ryan Nielson) believes he has it made juggling his three fiances. That’s right. Three gorgeous fiances Gloria (Nykeigh Larson), Gabriella (Katharine Strom) and Gretchen (Jessica Scott), who thanks to their jet setting lifestyle as flight attendants at three different airlines don’t know the others exist. With the help of Berthe (Jennifer Inderlee) his reluctant maid, Bernard is able to keep his posh Paris apartment organized and the girl none the wiser of what is going on. Well, that is until Robert (Kyler Chase), Bernard’s friend from Wisconsin arrives for a visit and chaos breaks loose. This fast paced comedy is perfectly cast. Ryan Nielson and Kyler Chase are the perfect duo for the demanding physical comedy of this script. Jennifer Inderlee, Katharine Strom and Jessica Scott have mastered their French, Italian and German accents respectively. Scenic Designer Mark Koski created a beautiful apartment which feels plucked right out of the 1960’s with its mix of mid-century and mod furniture styles. If you’re looking for a show full of side splitting laughter, than Boeing Boeing is for you. The show plays through June 21 at Lyric Arts Main Street Stage in Anoka. For more information on the show or to get tickets, visit their website.